Free Motion Quilting: Set your sewing machine for straight stitch. No additional setting is needed for length because you determine the length of stitch my how quickly you move the quilt under the needle. With your prepared quilt top, batting and backing, hold the quilt with both hands under the needle. Put the presser foot down and sew a few stitches in place to secure threads. Move the quilt around in a meandering fashion, stitching a continuous line pattern to quilt the quilt. Thread Painting: Use a straight stitch and free motion fill shapes with thread. This is a fun and unique way to sew machine made embroidery with beautiful texture. Use a removable fabric marking tool to draw your design on the fabric surface. Fill in each design element with the thread colors desired. Experiment with various types of threads. For example, variegated threads can add interesting dimension. Rayon threads add a beautiful sheen. Metallic threads can be a nice touch for holiday projects or for added drama. When thread painting with rayon or metallic thread, use a SINGER chromium embroidery needle for best results. Darning and Repair: You can repair tears and holes in fabric with the Darning & Embroidery Foot. Apply a small scrap of fabric to the back of the area in need of repair. Back the area with a layer of stabilizer. Select straight stitch and sew over the torn area in two steps moving the fabric back and forth to free-motion stitch. In step one, sew back and forth in a vertical motion to cover the affected area. In step two, sew back and forth in a horizontal motion. Once the area has been covered in stitches sew in place a few stitches to secure and trim away excess backing fabric and stabilizer. Free Motion Monogramming & Embroidery: You can monogram using free motion with the Darning & Embroidery Foot! Select a ZigZag stitch and set the stitch length to zero on your sewing machine. Mark the desired monogram letters onto your fabric with a removable fabric marking tool. Back your fabric with stabilizer and optionally hoop your fabric. (Hand held hoops are sold as an optional accessory.) 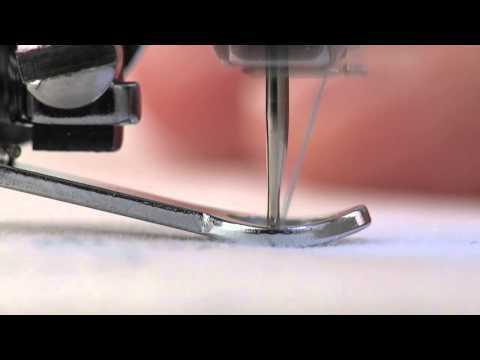 Stitch slowly guiding the fabric so that your sewing machine stitches evenly along the lines of the letters. The stitch length is determined by the speed at which you move the fabric. With a little practice this technique can be used to personalize many projects. Installation: First remove the regular presser foot and presser foot holder. Refer to your sewing machine manual and depending on your particular sewing machine model, either cover or lower the feed dogs to disengage them. M1: 1507, 1507WC, 8280, TRADITION Series: 2250, 2259, SIMPLE Series: 2263, 3116, 3221, 3223, 3229 3232, PROMISE Series: 1408, 1409, 1512, 2273 ESTEEM. M2: Heavy Duty Series: 4411, 4423, 4432, 5511, 5523, 5532, 5554, 4443, 4452 Talent Series: 3321, 3323, 3323S, 44S Classic. M3: INSPIRATION Series: 4205, 4206, 4210, 4212, 4218, 4220, 4228. M4: Commercial Grade Series: CG-500, CG-550, CG-590, PROFESSIONAL Series: HD-105, HD-110, P-1250. C3: CURVY Series: 8763, 8770, 8780, 5625 STYLIST II, 8768 HERITAGE, 2009 ATHENA, SINGER ONE & ONE PLUS, 160 Anniversary Machine, 70 Jo-Ann Fabric Anniversary, CONFIDENCE 7400 Series including 7467S CONFIDENCE STYLIST, 7469 CONFIDENCE, 7469Q CONFIDENCE QUILTER, 7470, 7256 FASHION MATE 5560, 7258 STYLIST, 7285Q PATCHWORK, S800 FASHIONISTA.